Notice the area of catastrophic, severe, and widespread damage. Seems small, given the talk, doesn’t it? The thing to keep in mind with hurricanes is that the swath of actual severe damage most times, even for a major hurricane, isn’t all that wide. 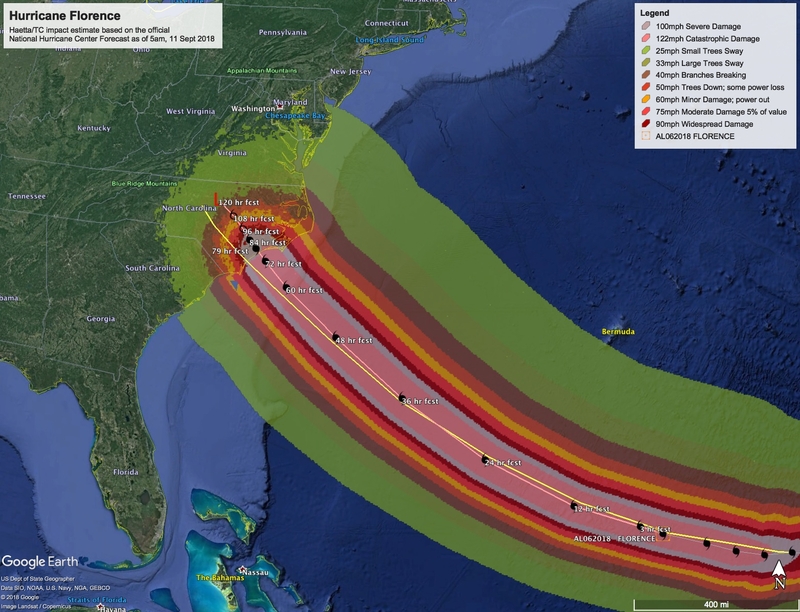 Media folks love to talk about how big the cloud shield is, or the extent of the over water tropical storm force winds, but for Florence, severe effects will extend about 120 miles to the right (north) of landfall, and 80 miles to the south. Of course the problem is we don’t know exactly where that 200 mile wide swath of damage will be in 3-4 days when it hits, thus the 600 mile wide watch and warning zones. Don’t be mislead by fluctuations in intensity, or brief north or south wobbles. For example, this morning the storm is going through an eye replacement cycle. It may even be a cat 5 at times. Along the coast the damage will be epic if the storm stays as strong as it is. 25, maybe even 30 foot storm surges in places where the water can pile up. Even inland, damage will be severe, with trees down and structures damaged. But especially scary is a detail in that map: notice that landfall is expected in 3 days – then the storm moves only 50 or 60 miles over the next two days. While the intensity will drop quickly after landfall, enough of the circulation is likely to remain over water to pump immense amounts of moisture over NC and VA. That means the potential for tremendous inland flooding. If you live near a creek, stream, or other flood feature, be aware that the waters may rise quickly. Local knowledge is everything in this kind of situation, but with so much water, and so much development (which changes radically the hydrology of an area) areas that have never flooded will probably flood. Comparisons are being made with Harvey. That may not be far-fetched. My damage models are still showing approximately $20 Billion in damage, with as much as $15 Billion in additional flood damage possible depending on variables like how long the storm sits and now much rain is dumped into Virginia. Florence is definitely on track to enter the top ten most damaging storms. At this point it is fairly clear who needs to take clear, decisive action. NHC has issued a hurricane watch for the coastline from Edisto Beach SC to the NC/VA border. I expect a watch or warning of some kind for parts of Virginia today are possible depending on minor track shifts and timing. Especially for those in Myrtle Beach and the northeast corner of SC, and all of eastern North Carolina, the hyperbole isn’t really that wrong here. If on the coast, or in low lying areas, get out. If within 50 miles of the coast in anything other than a substantial structure that you know can stand up to high winds, get out. If you are in the NHC watch areas you really need to take action and be gone before Thursday morning. That said, I again want to point out that for far southern South Carolina, south of Edisto Island, the risks are decreasing rapidly other than for rip currents and waves right on the beach in the surf zone. For Georgia, the risk at this point is vanishingly small. It will probably be a nice day as we (I live in Savannah GA) will be in the subsidence zone at the fringes of the storm, but don’t plan on going to the beach and swimming, as again waves and rip currents will be dangerous.